Hurray for another success story! Jean has adopted SIX dogs from Orphans of the Storm® (not simultaneously! 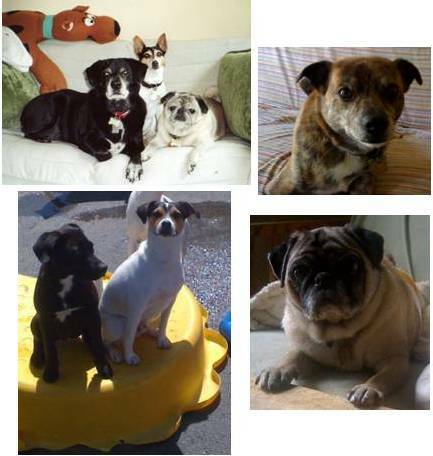 ): Labbie, Maggie, Mr. Pugley, Boo, Jack, and Diva. She has volunteered to share her stories about them, and why she keeps coming back to Orphans. Thank you, Jean! A: Besides helping dogs and cats, I think Orphans fills a need for the people in our community. Hang out at the office someday and watch a child adopting their first pet. What a thrill! What a memory! I remember meeting a woman that was adopting a Cocker Spaniel, she seemed sad and lonely and I suspected her husband had died. Her four adult kids and their spouses had all come to Orphans with her to meet the new dog. Caring for the Cocker would help her take a step forward in her new life. There was another woman who was spooked about something, not sure what, but she was adopting a dog that had been tossed by the side of the road in Lake County. I sensed that they would protect each other. Pam picked out Maggie, a Rat Terrier, for me and my couch-potato Labbie (also from Orphans). Those two loved each other and I loved them. The miles we walked together! I had Maggie for 10 years, and for the rest of my life I will cry when I think about her dying. But then I am reminded about the morning after she died. Labbie was gone by then and I was walking Boo (crying hard). It was late February, warmish, but huge, dark clouds were pouring giant snowflakes, and I could hardly see. I rounded the corner, towards the east, still crying, and suddenly, the clouds parted, and this huge brilliant ray of sun beamed through—and I knew that she was okay. I will be forever grateful for that moment. I wonder sometimes if all the wonderful folks that support the animals at Orphans know how much they are helping the people in our community also. A: I grew up in Lake County; I have always known about Orphans. A: It’s the right thing to do; besides, I like older dogs. Finding a dog is like finding a human friend: relationship longevity works best if they dig your lifestyle. Human or dog, it take some aging to “refine” what you want out of life. Q: Was this your first pet dog? A: No. My first dog was Charlie, an old Beagle. We lived in Colorado. He went everywhere with me. A: No. I recommend thinking carefully about your situation and asking the staff or volunteers for help. If you are honest and open your heart, the color and size (and amount of hair!) of the right companion might surprise you. Q: How many dogs did you visit with in one of the off-leash runs before you decided? Q: What sealed your decision to adopt your dogs? A:For me, it’s an emotion. I just know and I commit. A: There were accidents and scary nights—never a problem, just a new adventure! Boo took off (shimmied under the chain link fence, I later figured out) at 10:15 at night. I drove around but it was pointless. He’d just come home with me—didn’t know me, and a brindle is impossible to see in the dark. A noise outside my bedroom window woke me up at 2 a.m. It was Boo, he’d came back (under the chain link fence). After 4 months at the shelter, that dog needed some space to stretch, run, and sniff. I was surprised and delighted. I guess he did know me, and more importantly, he knew this was his home. Posted by Meet the Pooches on October 17, 2012 in Interview and tagged adoption, animal shelter, dogs, Orphans of the Storm, pets.